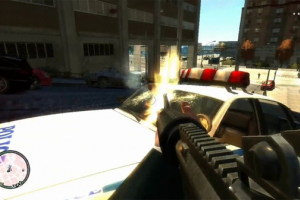 "Your shoots in GTA IV are more precise with the first person mode"
I doesn't only work when you are trying to shoot your rivals, but also when you are driving a car. To drive a car in this mode is totally different, you can see your hands and the interior of the car. These factores make that your game play definitely more realistic. When it's time to shoot, you have a better visualization of the target and it's easier to be more precise with your shots.